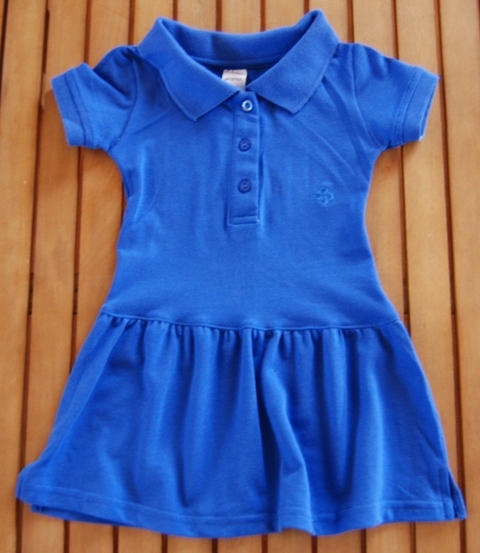 I had bought 4 ladies polo shirts recently thinking that they would make good everyday wear around home. However, like sometimes happens, once I got them home they weren’t quite right for me (freakishly high neck lines for a ladies shirt making my bust look really low – but that is another story). 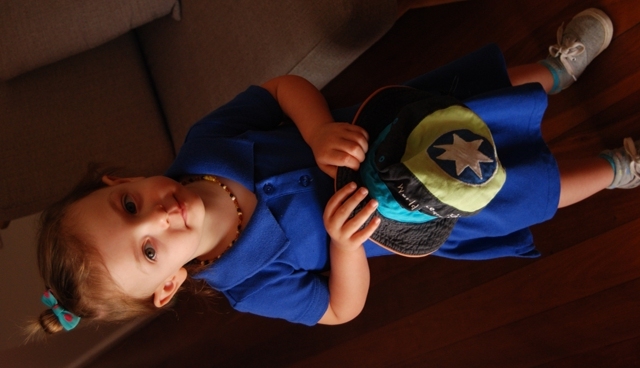 So the shirts sat in my cupboard, never seeing the light of day until a favourite little play dress of ours finally became un-wearable and I saw the opportunity for a conversion and to perhaps feel a little better about the unused shirts. Because I used the existing collar, cuffs and hem of the t-shirt, this was an extremely fast project, I think it took me about 15min. 1. First I lay the old dress down on top of the polo shirt, lining up the shoulders (you could use a slim fitting t-shirt here instead with no problems), I cut around the body section in the shape of the existing dress making sure to leave seam allowance. 2. 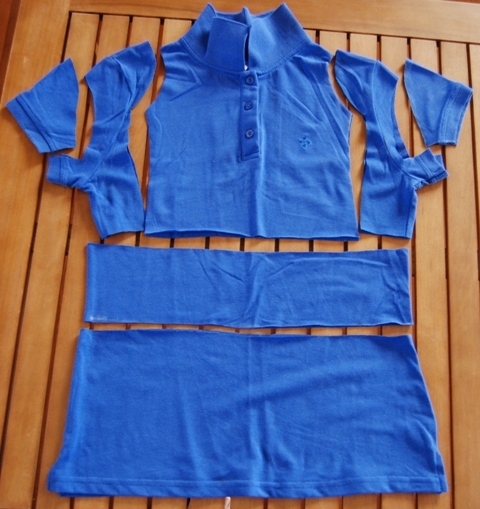 I lined up the sleeves of the existing dress with the top fold of the polo shirt sleeves and with the cuff. I cut around the sleeves, again leaving seam allowance. 3. Finally, I measured the length that I required for the skirt and cut that from the bottom hem of the shirt, adding seam allowance of course. 4. The next bit was simple enough, I sewed the sleeves to the body piece, making sure that I lined up the shoulder seams with the folds in the top of the sleeves. I did this project on the overlocker/server which is the easiest thing when sewing knits, if you are using your sewing machine I believe you could use a zig zag stitch with success. 6. The next thing I did was to gather the skirt piece so that it was the same distance around as the bottom hem of the body piece. I then sewed the two pieces together and topstitched the seam (although I think the finish would have been better had I not added the topstitching). 7. Done! 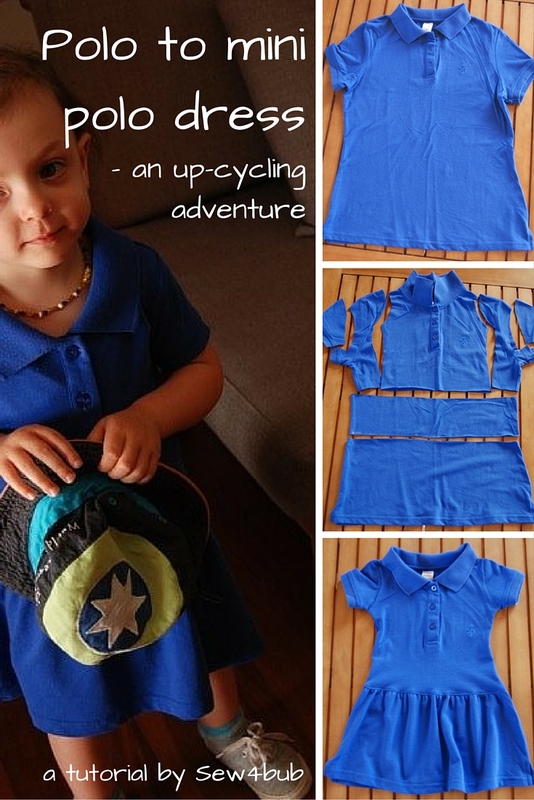 One 15 min mini polo dress conversion. 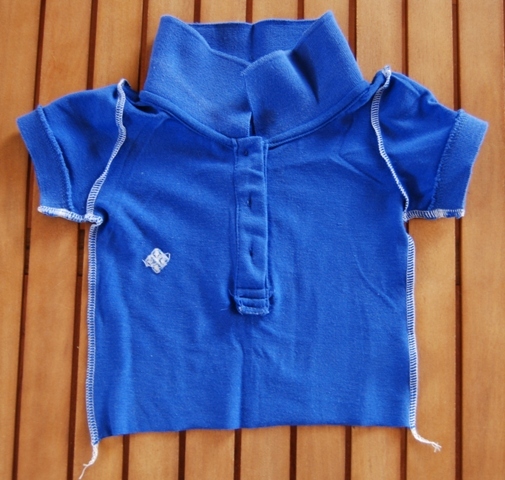 For an idea of sizing, my daughter is 2 and this was a size 10 ladies polo shirt. This is lovely. I’m going to give it a try. I think the top stitching gives it a nice finish. Thanks so much for sharing. Awww.. how cute! You make it look so easy. Thanks for the tutorial. Oh My Heck! That is the cutest!